Patisserie - Noblest Patisserie specialties made for a refined pleasure. All good things come in 4 exquisite delights. We have something for every taste! Cappuccino: Relax the Italian way Relax and enjoy this speciality the unique pleasure of a creamy Italian cappuccino, wrapped in chocolate. 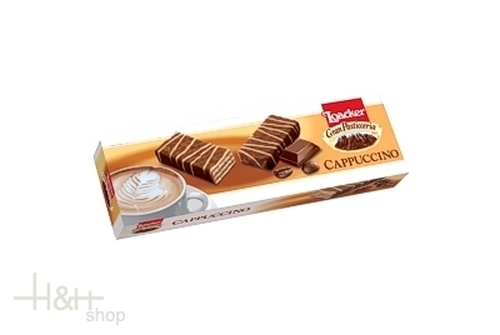 The aroma and taste of coffee in an exquisite milk chocolate cream, with deliciously crisp wafers: treat yourself to a moment of real pleasure. Milk & Cereals is a light snack, ideal at any time of the day as an energy provider or for filling hunger gaps. Crunchy milk chocolate cookie bar with wheatgerm crispies, filled with delicious milky cream - a boost of energy in every bite.